Having a Crock-Pot Slow Cooker has been a total life changer. When I was commuting to work (up to 2 hours a day in traffic… each way!) my Crock Pot was my best friend. I could throw in all the ingredients for a chili and come home to a ready-made hot meal and an amazing smelling apartment. Fall and winter is my favorite time to use the slow cooker—there are so many yummy soups, stews, and even yummy desserts such as cinnamon apples, that you can make in a slow cooker. If you’re not much of a cook or are just starting out, I definitely recommend this as it will become your best friend in the kitchen. Another item that has made my cooking life, well more like my cleaning life, simpler is my silicone baking mat. I’ve made everything from roasted veggies, garlic bread, cookies and even macarons on this guy and it’s held up wonderfully. Better yet? Cleaning it is SO easy—just wipes it down with soap and water, no more soaking and scrubbing my baking trays! If you’re a frequent baker, definitely pick one of these up. I love adding fresh citrus juice to recipes and this tool has made it even easier. Instead of standing there twisting and grinding my lemons, or worse, squeezing them bare hand and getting more lemon juice everywhere else (including in cuts or scratches-owwie!) and seeds in my food, I just cut my lemons or limes in half, pop them in the citrus juicer and squeeze! It’s a great stress reducer, too! Having the appropriate cutlery can make such a difference in the kitchen. Spend a few bucks more on decent chopping knives—trust me, you won’t be sorry. My top three knives include a good, sharp Chef’s Knife, which is an all-purpose knife that can cut and chop just about everything from mincing garlic to cutting strips of chicken, a Paring Knife which is good for more detailed slicing and peeling such as with fruits and veggies, and a Serrated Knifefor cutting bread, tomatoes and anything else with a crust or firm skin. Not only are wood boards perfect for chopping veggies and cutting up fruits (keep the meats off! ), they can do double duty as a cheese board too. Extra points if it’s in a cute shape, such as my California-shaped wood board! 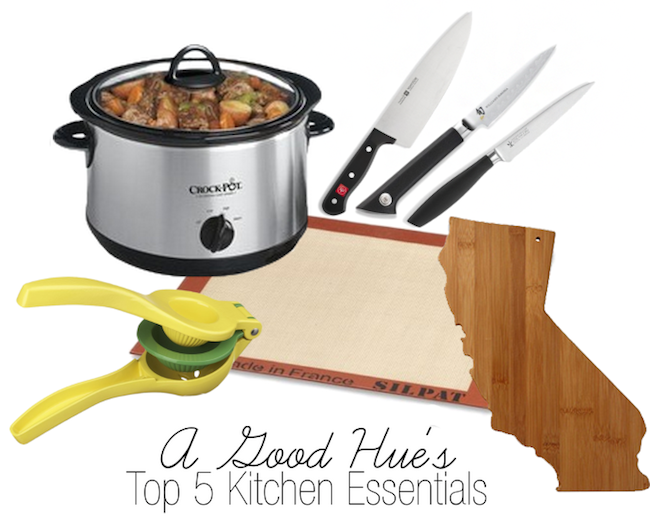 Do you have any other kitchen gadget or tool must-haves?